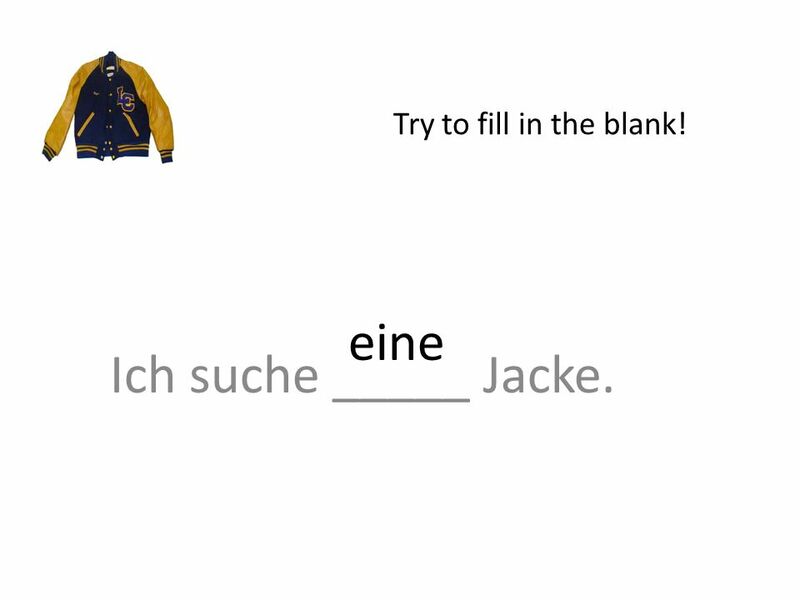 Der die das ein eine ein Wie sagt man “the” auf Deutsch? 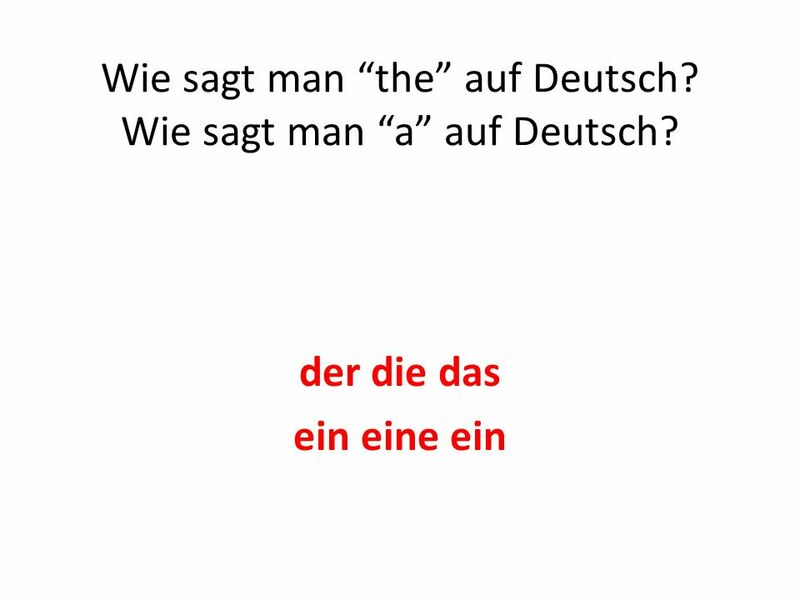 Wie sagt man “a” auf Deutsch? 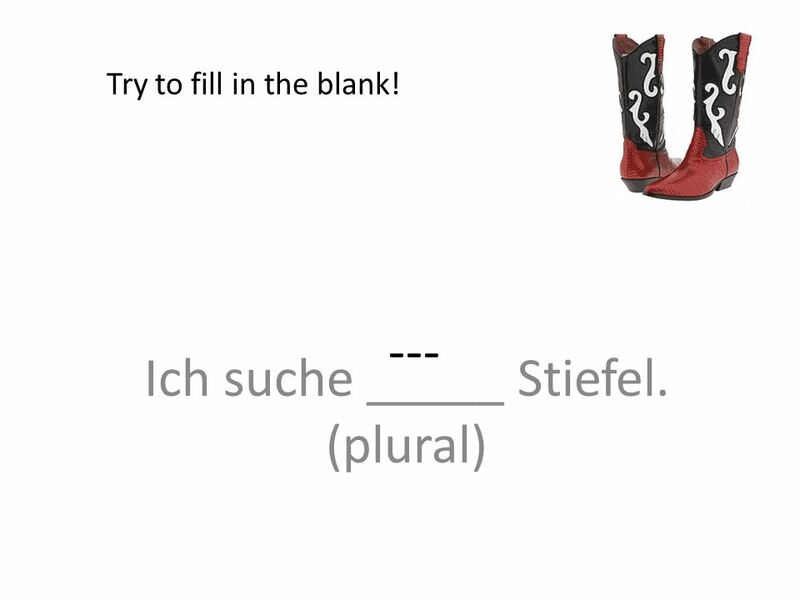 1 der die das ein eine ein Wie sagt man “the” auf Deutsch? 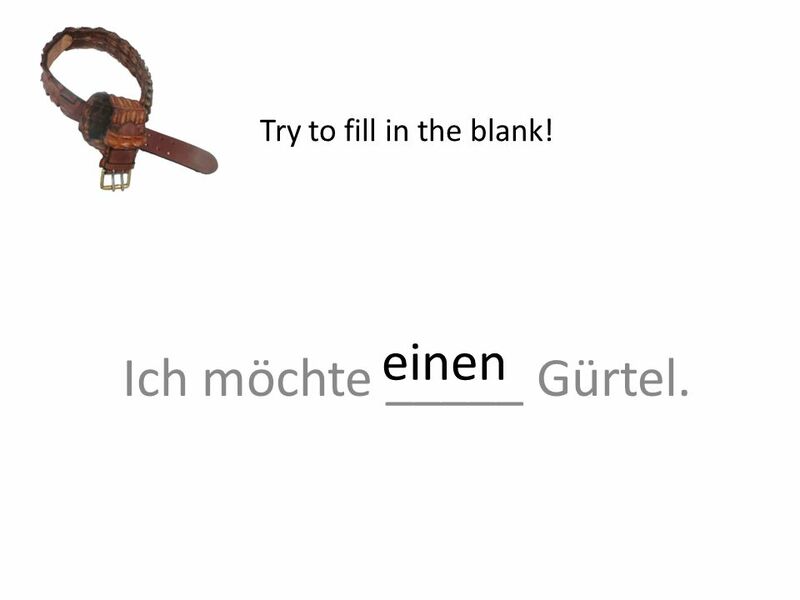 Wie sagt man “a” auf Deutsch? 2 The (der, die, das) is for something specific. 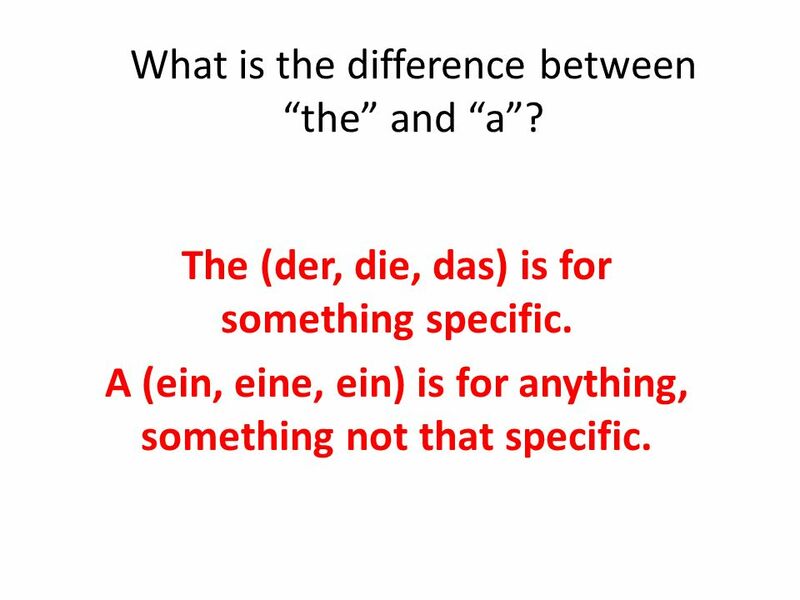 A (ein, eine, ein) is for anything, something not that specific. 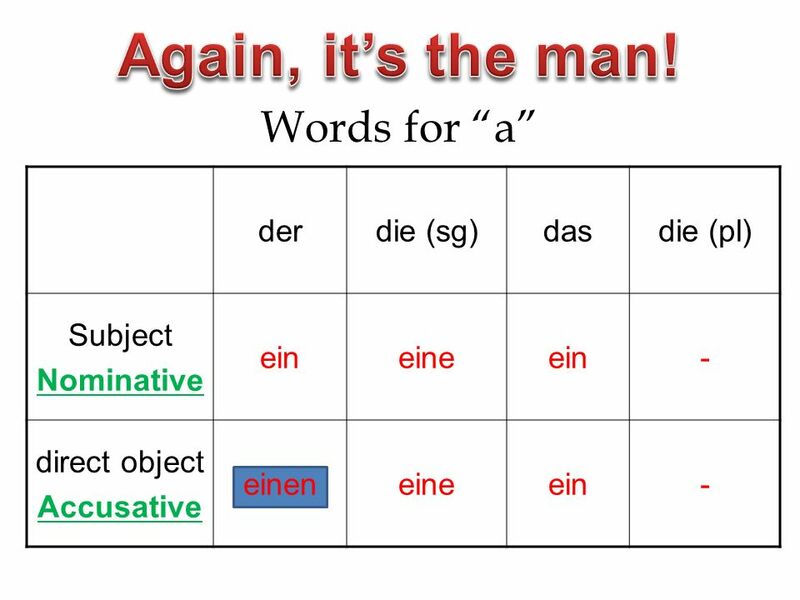 What is the difference between “the” and “a”? 3 Ein Pulli ist blau. 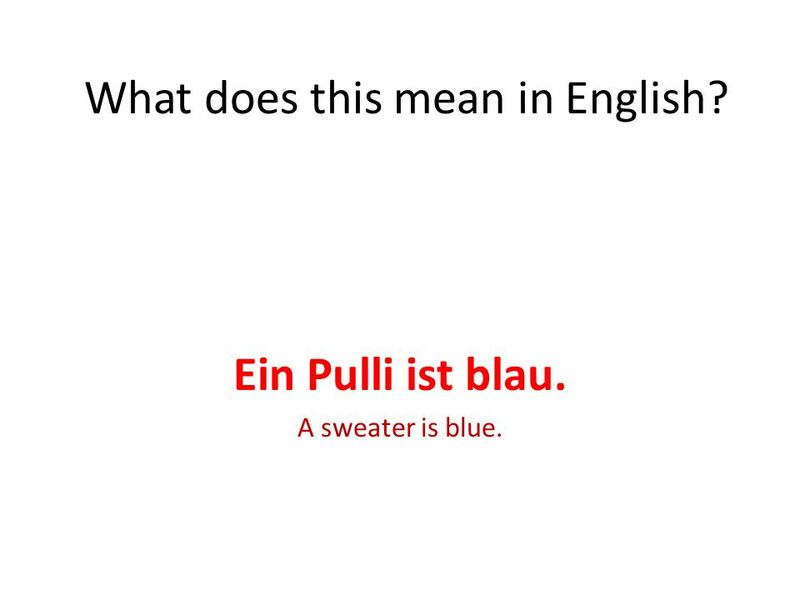 A sweater is blue. What does this mean in English? 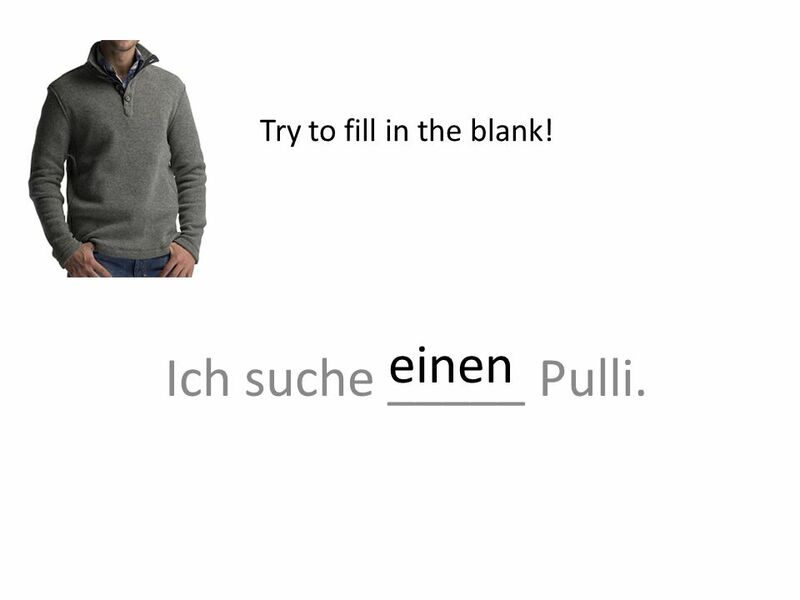 4 Ich brauche einen Pulli. I need a sweater. What does this mean in English? 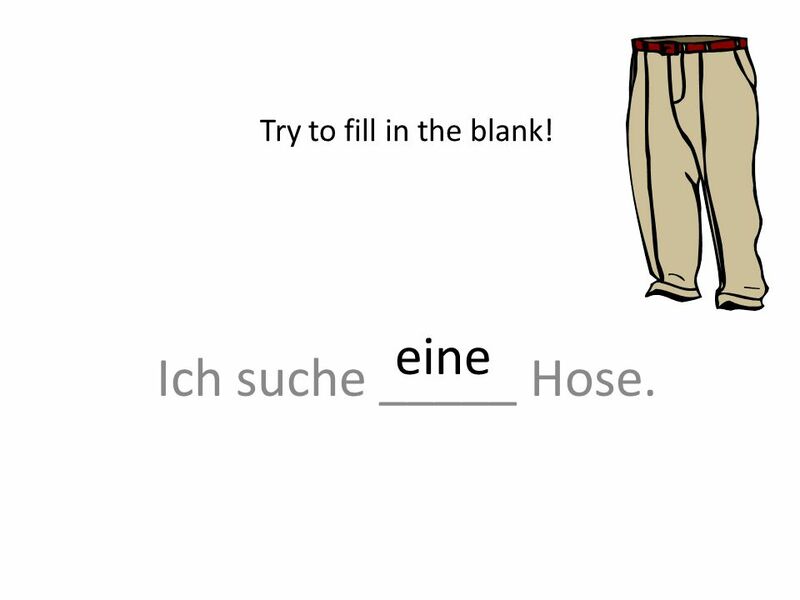 6 Ich brauche eine Hose. Is there a difference in article in these sentences? Eine Hose ist pink. 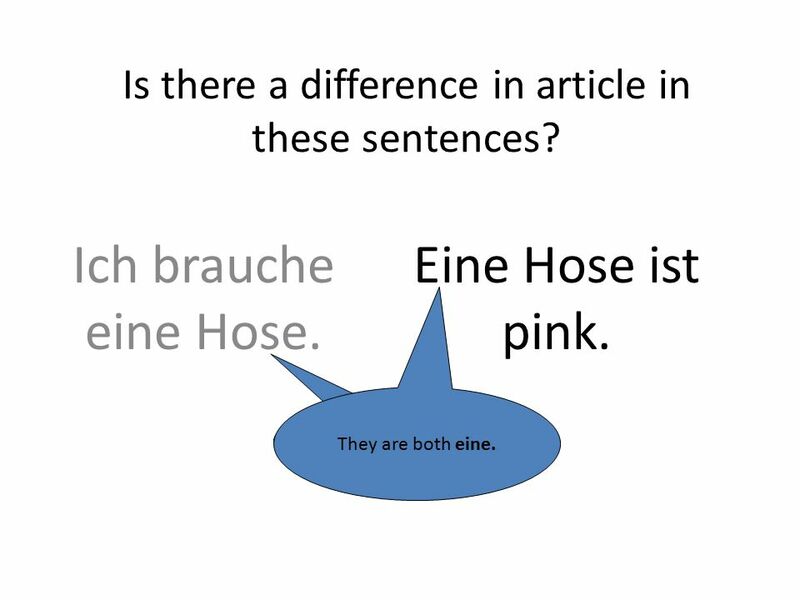 They are both eine. 7 Ich brauche ein Kleid. Is there a difference in article in these sentences? 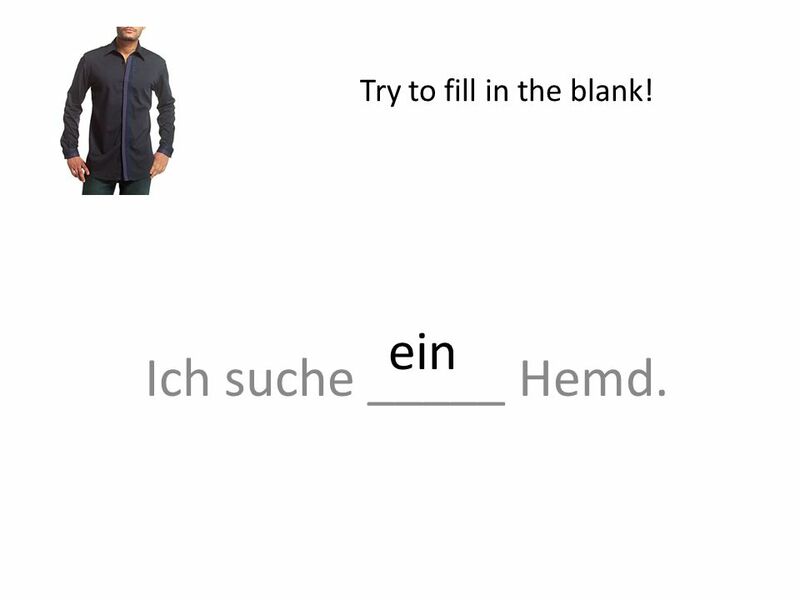 Ein Kleid ist braun. They are both ein. 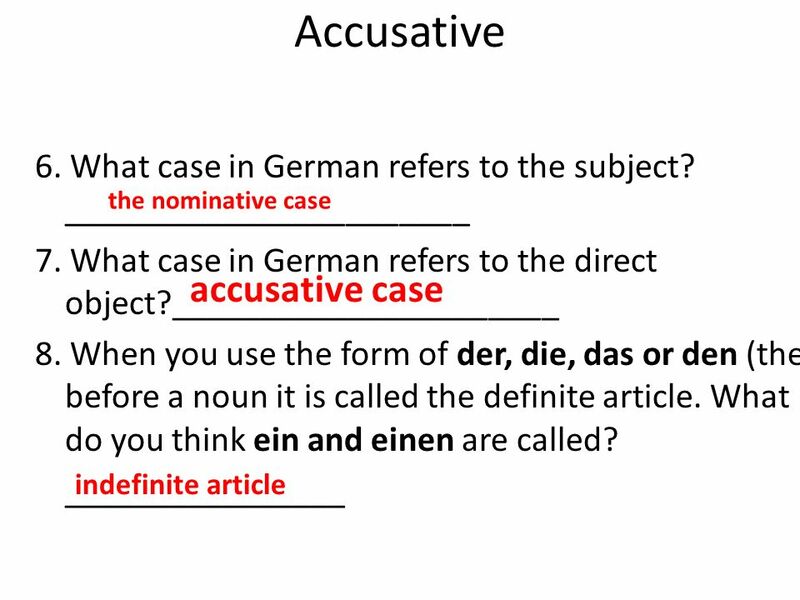 20 Indefinite Article – Accusative Case 1. 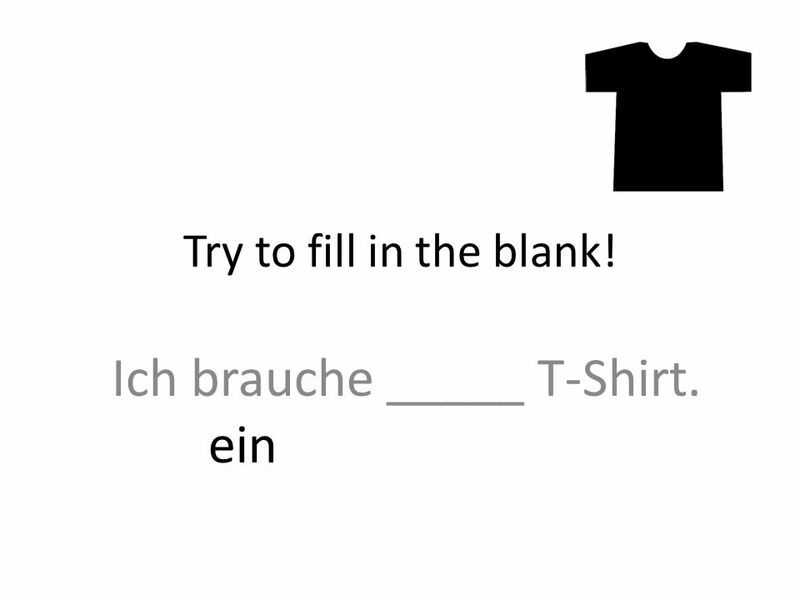 Read the 2 sentences below out loud: Ein Rock kostet nur 30 Euro. Ich möchte einen Rock. 2. What article is used before Rock in the first sentence? _______ _____ _____ 3. What article is used before Rock in the second sentence? _________________ 4. 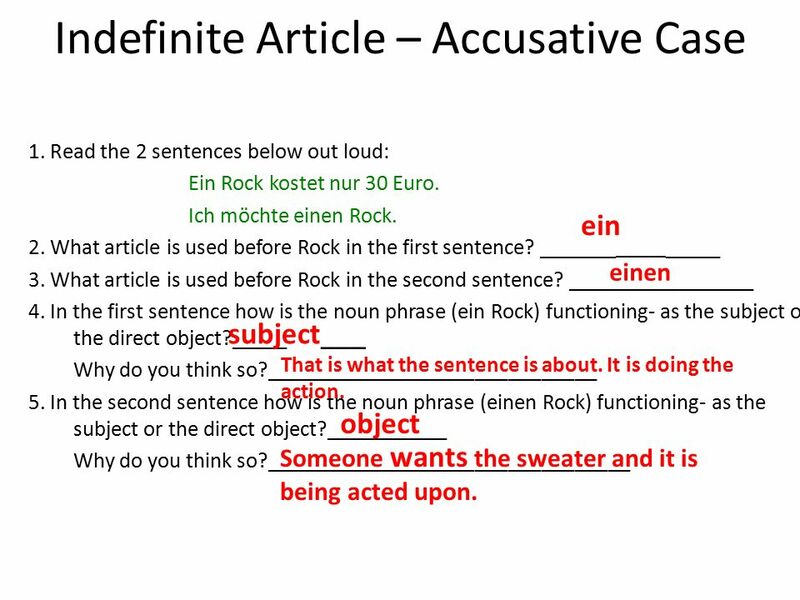 In the first sentence how is the noun phrase (ein Rock) functioning- as the subject or the direct object?_____ Why do you think so?______________________________ 5. 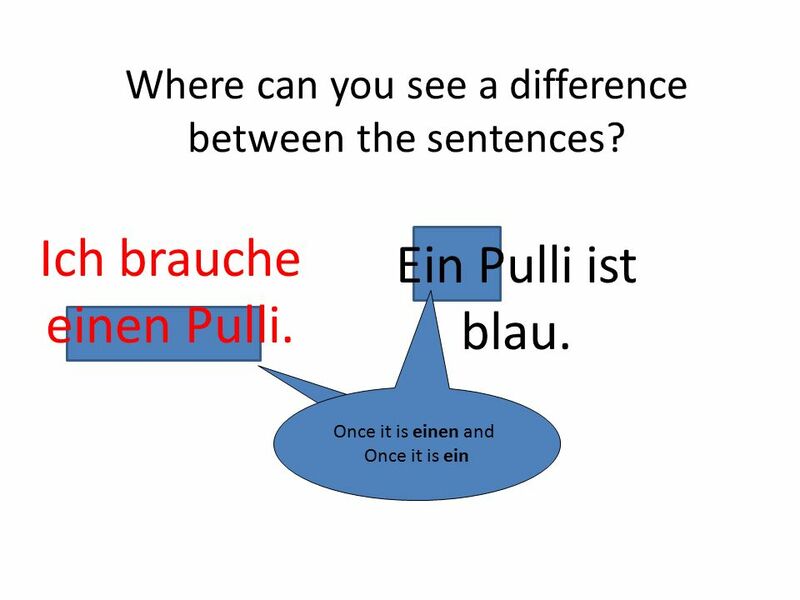 In the second sentence how is the noun phrase (einen Rock) functioning- as the subject or the direct object?___________ Why do you think so?_________________________________ ein einen subject___ That is what the sentence is about. It is doing the action. 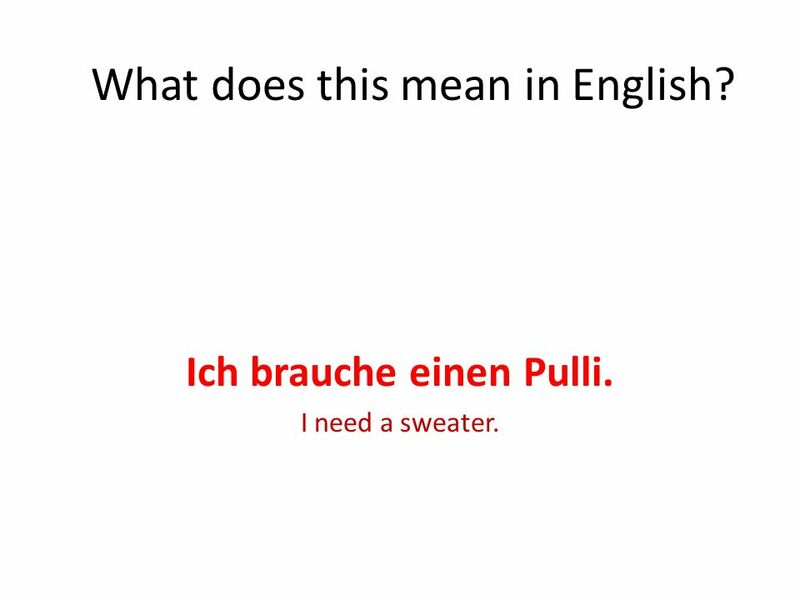 object Someone wants the sweater and it is being acted upon. 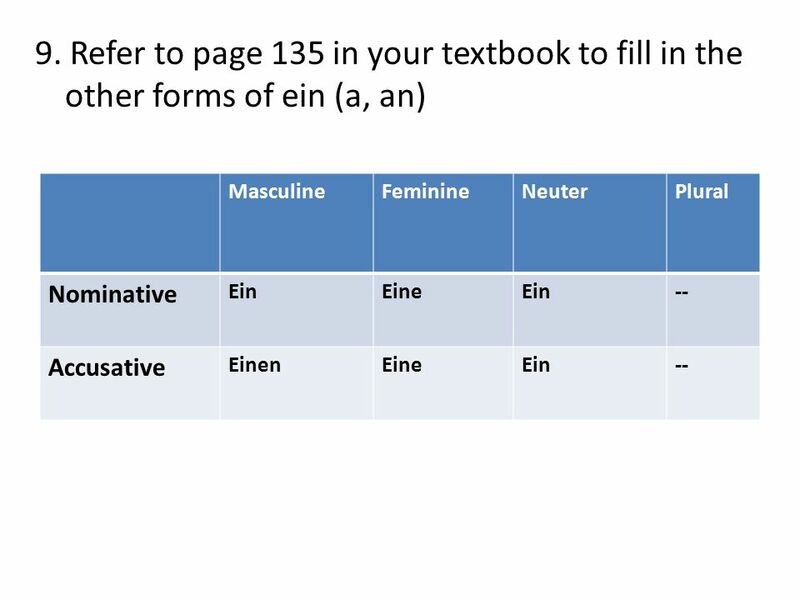 Herunterladen ppt "Der die das ein eine ein Wie sagt man “the” auf Deutsch? Wie sagt man “a” auf Deutsch?" 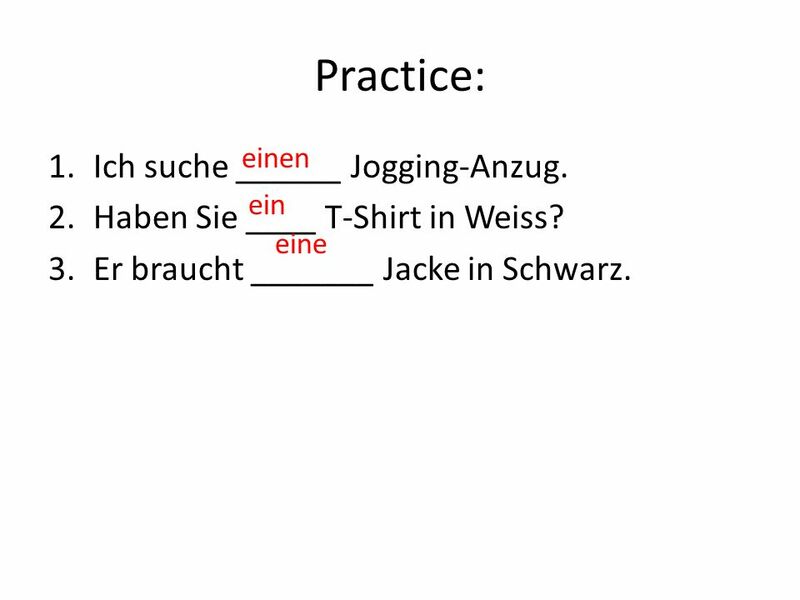 Chapter 5 Klamotten Kaufen You need to know your vocabulary You need to know direct objects You need to know pronouns You need to know 2 kinds of articles. 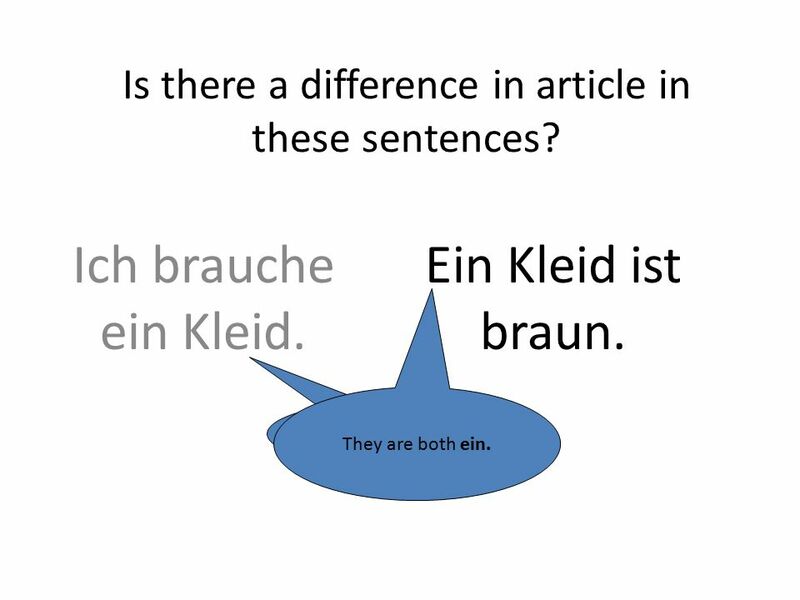 Indefinite Articles So far we have learned definite articles, which are the words for the: der/den das die Indefinite articles are the different words. Heute ist Freitag, der 7. Oktober 2005. Guten Morgen! Heute ist Donnerstag, der 20. September 2007. Kapitel 1 Grammar INDEX 1.Questions 2.Nouns 3.Definite Articles 4.Subjects 5.Subject Pronouns & Sein.